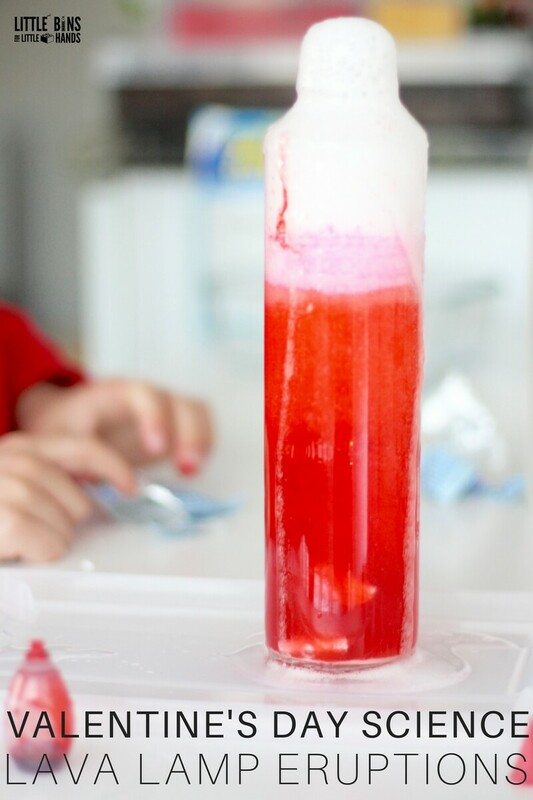 Erupting science experiments and activities are totally cool. 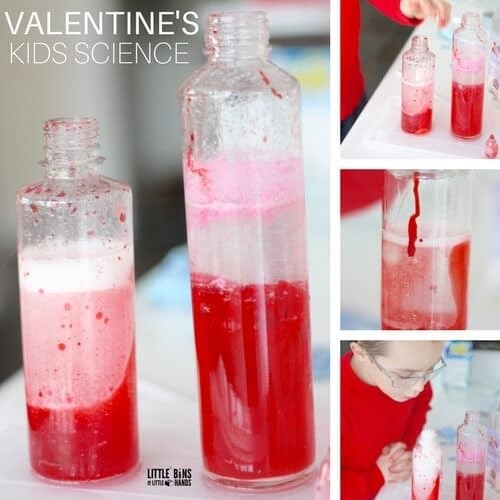 Why not make a Valentines Day science activity with two interesting demonstrations for kids. Explore liquid density and explore a fun chemical reaction too. Holiday themed STEM ideas and science activities are top on our list of cool things to do for holidays. Young kids and science mix really well, unlike oil and water! 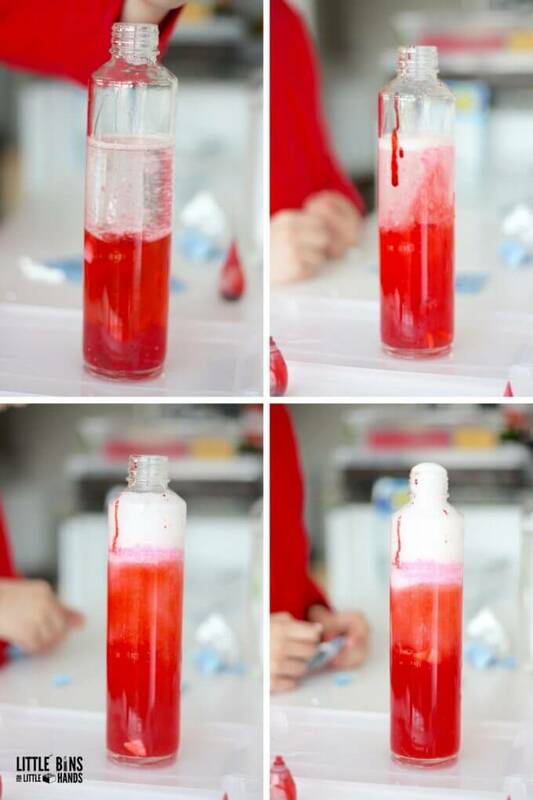 Simple science activities you will find on our site also have a playful element to them. We love really fun, hands-on activities that can be easily set up. STEM activities and science ideas can easily be changed up for seasons and themes. That’s a wonderful way to revisit science concepts without it getting boring. Young kids love the novelty of holiday themed activities. My son sure does. 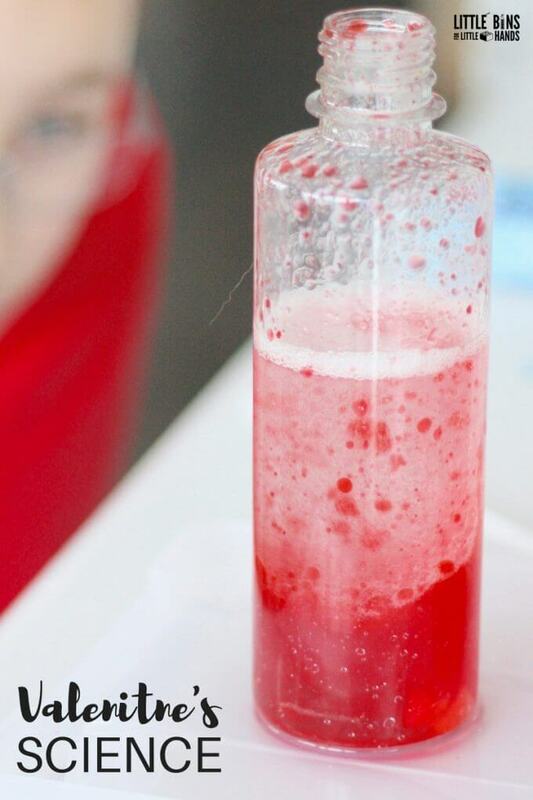 This Valentines Day science activity asks some great questions! Do water and oil mix? Why or why not? Why does Alka Seltzer tablets cause the bubbles to form? Why does it erupt? Make sure to ask these great questions before you start different phases of your experimenting. You can teach kids how to make a prediction or a hypothesis with just a few simple questions. Add our science journal pages to extend the learning for older kids. Give kids time to examine and observe the changes they can see happening. See full set up below! 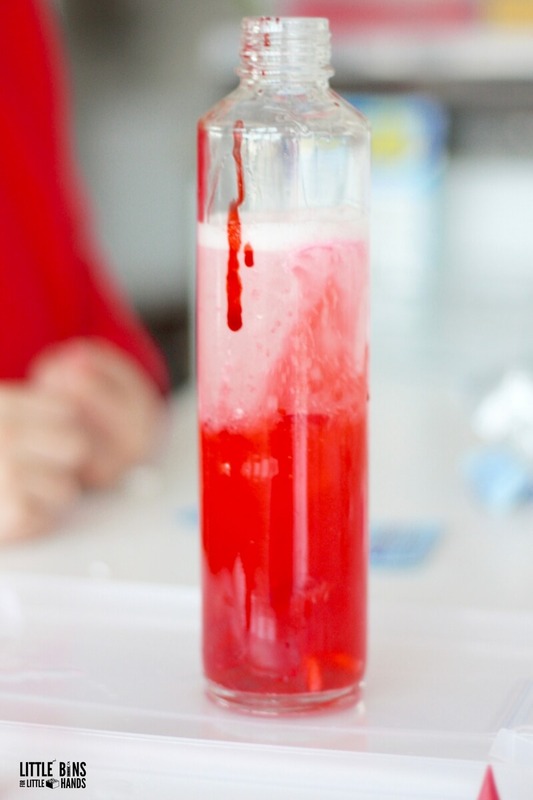 There’s a lot of room to explore and get creative with this simple science activity. Mix and add to your hearts content. You can easily set this up as a potion mixing table. 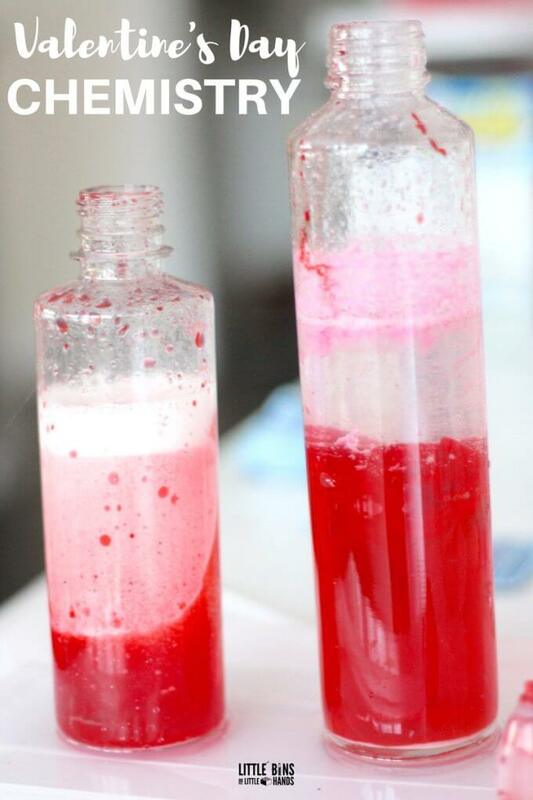 We love potion mixing for year round science. Have your kids add either the water or oil first. I recommend adding both liquids. Make sure to stop and observe whats happening! Next add color! Of course we chose red for Valentine’s Day but you can really choose any color! 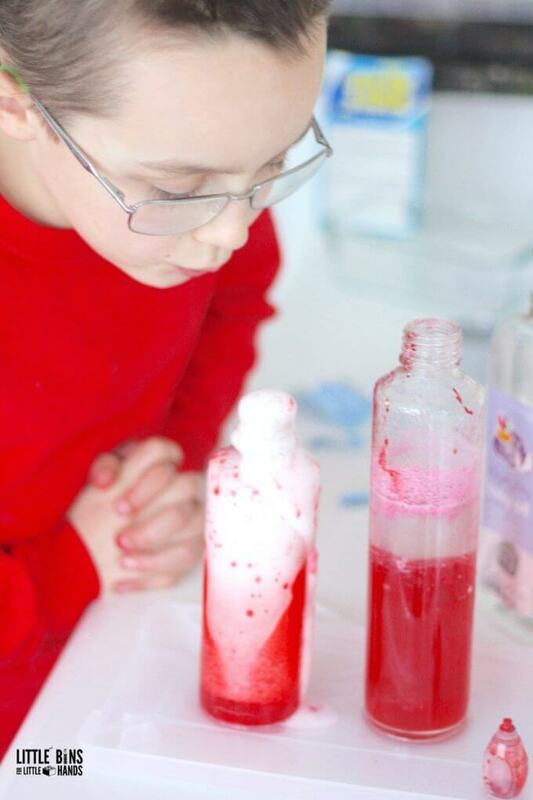 Take a look at our other colorful lava lamp experiment. 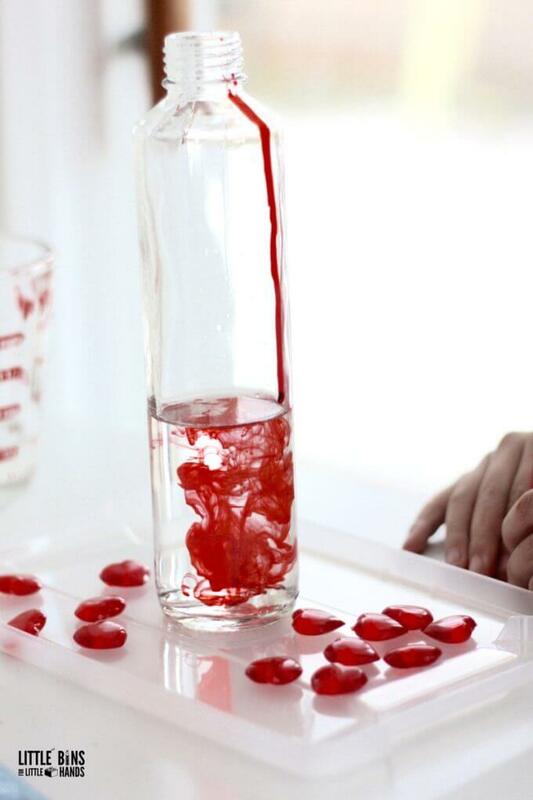 You can also drop in plastic hearts just for an extra touch of Valentine’s Day fun. Make sure to note if they sink or float. Now’s the exciting part, break up your alma seltzer tablets into 1/4th’s or 1/2th’s. 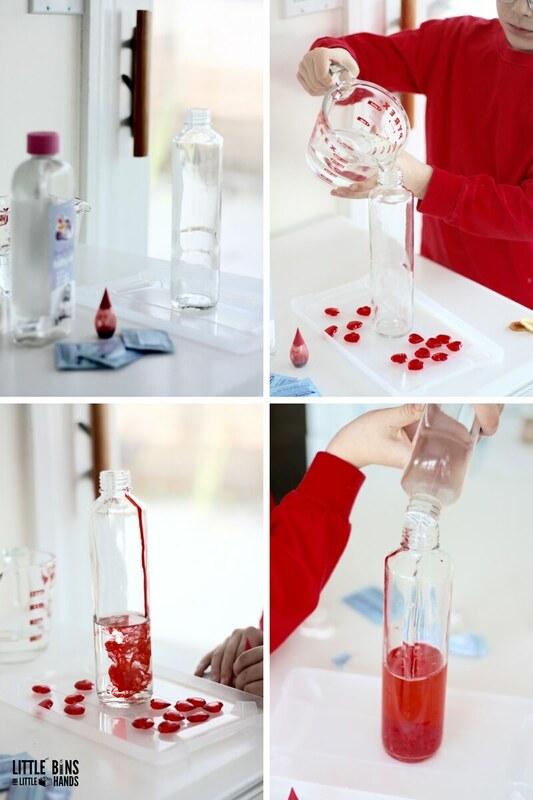 Add one piece at a time to the bottle and observe what happens! Let’s start with exploring liquid density. What happens when you add the oil to the water or vice versa? The two liquids separate. Oil is lighter than water and oil does not dissolve in water, so it floats to the top. Put the cap on the bottle and shake it up! What happens immediately? What happens over time? The liquids will always separate. 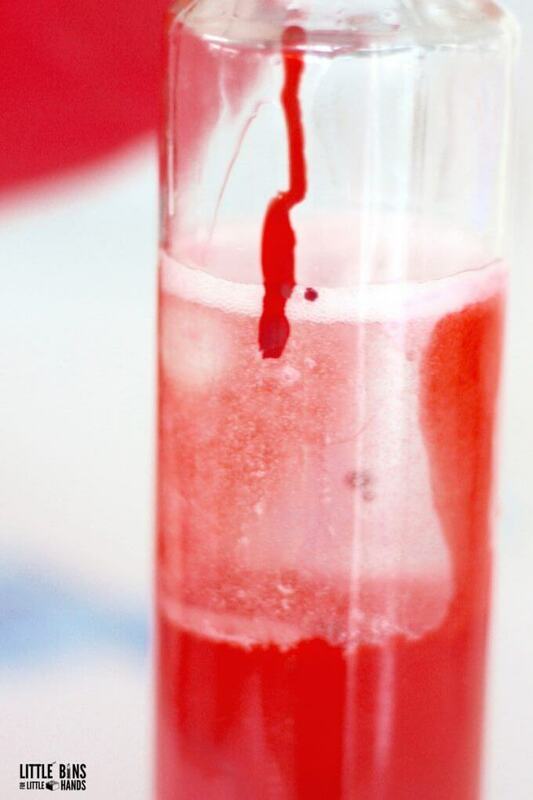 You can also add rubbing alcohol or corn syrup and check out what happens. Now what about the Alka Seltzer tablets? Have you ever had a tablet in a glass of water for a yucky tummy? Do you remember the fizz? The tablet contains an acid/base mix that when combined with water produces a gas, carbon dioxide. Carbon dioxide causes all the bubbling fizzing action. If you use a container that is narrow and you use extra pieces of tablet, you can make it erupt. The gas has nowhere to go but up and out. Now if you don’t add a ton of tablet pieces at one time, you can observe the colored water bubbles that rise up through the oil and sink back down again. This gives you that lava lamp look. The two liquids, water and oil naturally separate. Oil is lighter than water. 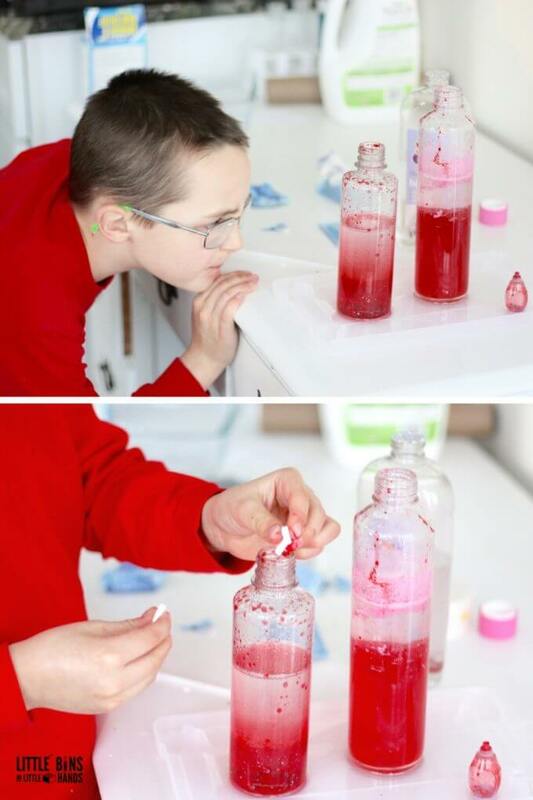 Adding an Alka Seltzer tablet will make your Valentines Day science activity look like a lava lamp. If you have a kid like mine, he’s way more interested in adding all the tablets at once. Because things that erupt are always the coolest! Make science super fun for kids and you will be providing an awesome base for the future. 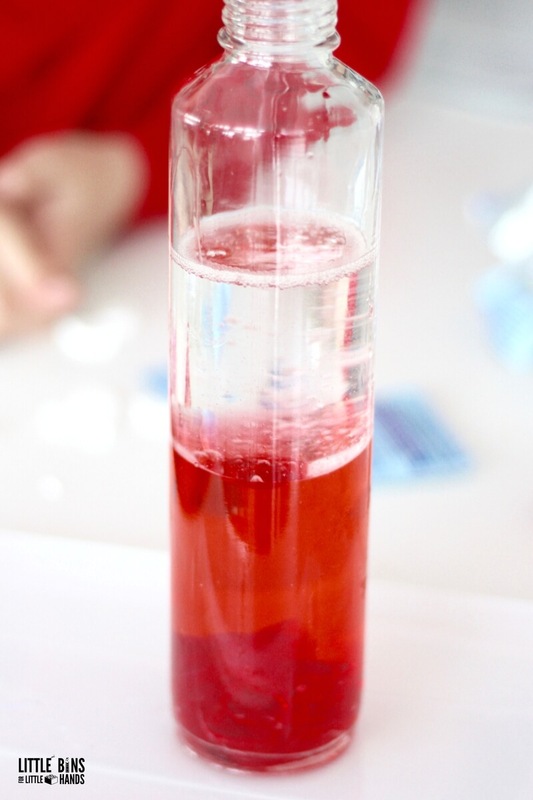 The ability to make observations, conduct experiments, trouble shoot, and think critically are just some of the great qualities a simple science activity or STEM activity can encourage! Check out our 14 Day Valentine’s Day STEM Countdown filled with unique ideas to try! This is really cool! I teach a program called Cradle School and the kids and parents, LOVE anything that bubbles over! I can’t wait to do it with them. Thanks!